Ham4Ham: Lin-Manuel Miranda and the cast of Hamilton reward ticket lottery entrants with free shows. #Ham4Ham, the joyous, free sidewalk performances outside Hamilton that are stoking the passions of a new generation of theater lovers. 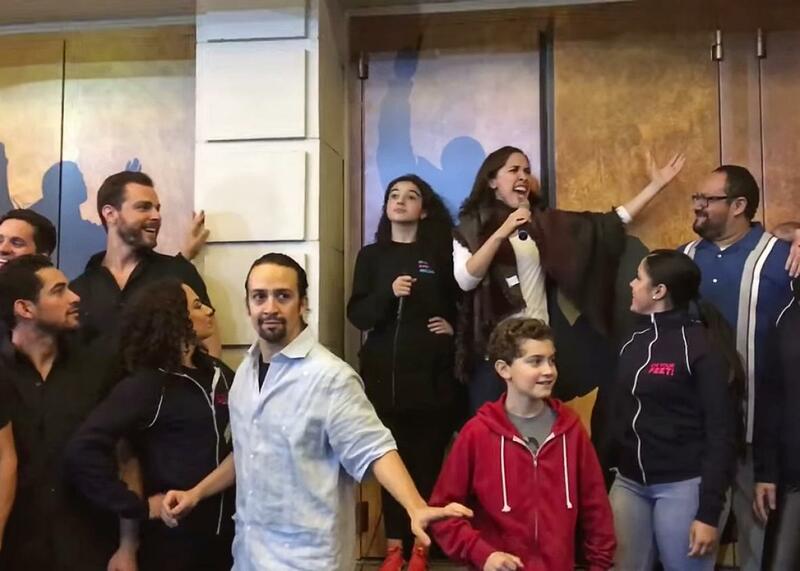 Lin-Manuel Miranda performs in the #Ham4Ham show with the cast of On Your Feet, on Nov. 21, 2015. For the past four months, the best show on Broadway has been spilling out into the streets. It started on the night of Hamilton’s first preview. The much-hyped, history-making show was sold out—except for the tickets that are sold via lottery two hours before showtime to lucky day-of visitors. Hours before the first preview was to begin, more than 700 fans showed up hoping to enter that ticket lottery—a pre-show turnout of the sort that hadn’t been seen since the closing night of Rent. Lin-Manuel Miranda, Hamilton’s composer, lyricist, and star, seems to have a special place in his heart for lotteries and against-all-odds stories. His first musical, In the Heights, centered around what happens to the neighborhood of Washington Heights when the owner of a small bodega (played in the show’s original run by Miranda) discovers that he sold a winning lottery ticket worth $96,000. His newest musical tells another improbable success story, about “the founding father without a father” who went from orphaned immigrant to George Washington’s right-hand man. So perhaps it’s no surprise that Miranda responded to this extraordinary turnout of fans hoping for lightning to strike: Caught by surprise and moved by the crowd, he came out the stage doors onto 46th Street to give a short speech to the crowd. The afternoon of the next show, on Tuesday, July 15, Miranda made theater history all over again, inaugurating what could be a new Broadway tradition with the first official #Ham4Ham performance. Now, a couple of times a week, even those Broadway fans who can’t see Hamilton—because they didn’t win the lottery, or because they live far away from New York—get a special show just for them, in person or on the Internet. Lin-Manuel Miranda has already transformed the kinds of performers, the modes of storytelling, and the kinds of music that can make a classic Broadway musical. Now with #Ham4Ham he’s transforming the way that Broadway connects with, and rewards, its fans. What’s a #Ham4Ham? On most Wednesdays and Saturdays, a little more than two hours before the evening performance—just before the lottery winners are announced—Miranda emerges out the stage doors, under the marquee, and greets the crowd, introducing a short performance to take place just off the sidewalk. Though he sometimes drops hints on his very active Twitter feed, no one really knows what the performance is going to be until Miranda bangs on the stage doors to signal for the day’s guest(s) to come out. It could be a poetry reading or a routine from the New York City Ballet; it could be a twist on Hamilton or another musical; if it’s Halloween, it could be a costume contest followed by Miranda and Hamilton’s dancers doing the choreography from “Thriller.” Just about the only requirement seems to be that each #Ham4Ham is one of a kind. The #Ham4Ham shows inherited their name from the musical’s ticket lottery right from the beginning, because the 21 or so winners get to see Hamilton for only $10—or in other words, for a Hamilton. But it’s also a fitting name because of the level of enthusiasm everyone brings to these pre-shows, from the “Faniltons”—the designation for the show’s growing fan army, who go HAM for the sing-along competitions and the costume contest (one dressed as the lottery bucket)—to the more famous participants, who do the performances pro bono, often an hour or two before their own Broadway shows, out of love for theater and for Hamilton. There’s no precedent for the #Ham4Ham shows’ free and regular on-the-street performances. The ticket lottery itself is a relatively new tradition, having been pioneered by Rent. When that instant hit opened in April 1996, its high ticket price (advance seats went for as much as $67.50, which doesn’t seem so high in the age of the $500 Broadway ticket but was a lot in those days) didn’t jibe with the musical’s message: As producer Jeffrey Seller put it, they wanted seats to be available to people “in their 20s and 30s, artists, Bohemians—the people for whom [Jonathan Larson] wrote the show.” So producers started offering $20 rush tickets, from the front two rows, a couple of hours before each show. The policy was a success—maybe too much of a success. Fans began showing up as early as the day before, camping out overnight, and the producers started to worry about the safety of the Rentheads. So, in July 1997, Seller and the rest of the team announced the first lottery policy. The practice spread quickly over the next few years, and is still popular, especially among shows hoping to draw younger audiences. (During #Ham4Ham, Miranda will often remind fans that if they don’t win the Hamilton lottery they can still enter the lottery for the revival of Spring Awakening, just a block to the north.) The only major change is that some shows—though not Hamilton—have started using the app TodayTix to conduct the lottery digitally. The spontaneity and variety of the dozens of #Ham4Hams so far make it easy to keep coming back (or at least to keep watching the performances on YouTube) again and again. During the first week of previews, #Ham4Ham shows included Miranda and costar Jonathan Groff rapping together in a reprise of the promotion they did for In the Heights, a game of “stump the band” with the show’s musical director, a performance of Hamilton’s “Cabinet Battle #1” with the roles switched, and—on the same night that the first family was in attendance—a Q&A with Miranda during which he answered questions using only lines from Les Miserables. (“What’s the best thing to do in New York?” “Lovely ladies …”) For opening night, Miranda’s presentation was more simple: In what remains one of my favorite #Ham4Ham performances, he read the opening paragraphs of Ron Chernow’s biography of Alexander Hamilton, which inspired the musical. “We were all crying,” ensemble member Ariana DeBose told me, and, as you can see on the video, that includes Miranda. Many of the #Ham4Ham shows depend on Miranda having ideas that same day, or even just a few minutes before coming out the stage door. One of the most popular #Ham4Hams, Miranda’s performance of Les Miz’s “The Confrontation” with Broadway’s first black Jean Valjean, Kyle Jean-Baptiste, was arranged via direct messages on Twitter that morning. (Tragically, Jean-Baptiste, who was also the youngest-ever Valjean at 21, died in a fall only a few weeks later.) DeBose told me that for another #Ham4Ham—in which she and other cast members who had all played the lead in Pippin performed “Magic to Do”—she had only 20 minutes to prepare. With so much on Miranda’s plate—in addition to Hamilton, he’s writing songs for Disney’s upcoming Moana—what does he have to gain from these extracurricular performances? Hamilton doesn’t need viral marketing—the show sold $27.6 million in tickets before it even opened, and nearly every performance is sold out through May. It’s true that the videos, which often spread quickly on social media, where some have been viewed more than 100,000 times, may be moving copies of the cast album: Though it came out more than a month ago, this week it hits No. 1 on Billboard’s rap albums chart for the first time. But beyond sales numbers, I think it’s not a coincidence that the first Broadway show to do something like this is one that’s so steeped in the culture and history of hip-hop. After all, for all its competitive bravado, hip-hop encourages more collaboration than any other major genre. Many of the performances are mashups (a very hip-hop art form), and are given mashed-up names in the form’s traditional style. For example, collaborations with last year’s Tony award-winning musical Fun Home are hashtagged #FunHam, #Homelton, or #Home4Ham. On Saturday, the #Ham4Ham was a lively crossbreeding of In the Heights and the cast of the new Gloria Estefan musical On Your Feet, which did not lend itself so easily to clever names. If the #Ham4Ham shows remind me of anything, it’s the way that the reigning Queen of Pop and King of Hip-Hop spent this summer befriending their closest competitors, with Drake jumping on songs and even full mixtapes with the would-be contenders to his throne, and Taylor Swift adding what sometimes seemed like the whole world to her #squad. In each case, as with Hamilton, the collaborations elevate competitors while reminding everyone who runs the game. #Ham4Ham shows also allow other members of Hamilton’s cast and crew to showcase their own sometimes hidden talents. That means star Daveed Diggs can demonstrate his skills at writing his own rhymes, ensemble member Andrew Chappelle can show how he can do all three parts of “Washington on Your Side,” and Phillipa Soo can give Beyoncé a run for her money by singing “Halo.” Some talents are more unexpected: The hulking Okieriete Onaodowan, who plays Hamilton’s barrel-chested Hercules Mulligan and James Madison, sometimes performs Broadway hits in the voice of Mickey Mouse. Befitting the show’s revolutionary roots, a real democratic spirit animates the #Ham4Ham shows. DeBose told me that the #Ham4Ham tradition has become “very community-oriented”—and that community has been expanding. One regular volunteer is Howard Sherman, a longtime theater advocate who has recorded more than 30 #Ham4Ham performances (he is fortunate enough to have an office across the street), with Miranda frequently depending on him to post high-quality HD footage. Sherman emphasized to me that he has “no connection to the show whatsoever,” and only participates because “I love theater,” but that doesn’t mean he doesn’t take his role seriously. (“I can’t start cheering or clapping,” he notes, “because it ruins the video.”) When he can’t make a #Ham4Ham, he’ll check with another unofficial volunteer, Laura Heywood, aka @BroadwayGirlNYC, to try and make sure someone will be there to capture the performance. Theater has always been known for building a sense of community, but Hamilton is showing how to build the same kind of community both online and IRL, between fans and performers alike. The biggest beneficiary of the #Ham4Ham shows is Broadway. Though Broadway audiences tend to skew old and white, the audiences who enter the lottery, or come just to see #Ham4Ham, or just watch videos online and then retweet them or Facebook them or GIF them for Tumblr—are young and diverse. And show after show, not only do they get a unique theatrical experience, but they experience Miranda’s infectious enthusiasm—not just for Hamilton but for everything happening on Broadway. He’s converting new proselytes to the religion of live theater day after day. #Ham4Ham audiences have seen choreographer Andy Blankenbuehler demonstrating how the show’s moves were inspired by Fred Astaire, and production stage manager Jason Bassett showing how he runs through all his cues on his crew sheet. Lately the performers coming out those stage doors have started bundling up, but Miranda plans on continuing through the cold weather. If he can keep this going long enough, he just might make it cool to be a theater nerd.